Applicants preparing for the Board of Certification examinations in HT and HTL will find valuable assistance in this handy guide. Covering all areas encountered in the exam, including fixation, processing, microtomy, staining, and laboratory operations. It features:* Over 1,100 multiple choice questions, arranged in chapters which correspond to the major content areas on the examination. Questions are then further broken down by topic. * Practice questions presented in a format and style similar to those included on the BOC certification examinations. * Valuable information about the development, content, structure, and scoring of the test. * Colour image-based questions. * Advice for preparing for and taking the BOC certification examinations. 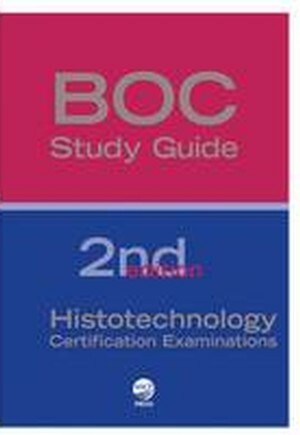 In addition to providing valuable help to applicants for preparing for the examination, its explanation of the structure and scoring of Board of Certification examinations makes it an essential text for officials of histotechnology education programs.